Selligent is a flexible, scalable, and secure B2C marketing automation platform used by various industries which include retail; media, entertainment, and publishing; travel and hospitality; and financial services. The platform helps marketers build relationships with each of their customers across different channels. Selligent provides them with capabilities so they can engage with their customers, establish long-term customer relationships, and optimize their marketing campaigns. With Selligent, universal customer profiles can be generated using data from cross-channel communications and website activities, allowing users to analyze and target their customers better. The marketing automation platform enables the delivery of messages and serving of web content that can be personalized based on the contextual information, actions, and behaviors of customers. Selligent permits the creation, testing, launching, and optimization of campaigns from one platform. It is also equipped with comprehensive reporting and analytics so users can understand how their customers are engaging with their brand. Last but not the least, the platform can be seamlessly integrated with third-party systems and partners because of its open architecture. To effectively convert more customers and nurture more profitable customer relationships, Selligent provides users with the capability to send and deliver the right messages and content to the right people at the right time and place. This is called contextual personalization. Thus, the platform lets users deliver personalized messages and content to customers based on their current situation and context. What’s very interesting about this is that contextual personalization in Selligent is done automatically. This means the messages and content are automatically personalized when they are triggered by predefined actions or behaviors by the customers. Furthermore, messages and content are automatically personalized when they are opened by customers, not when they are sent. As a result, whatever their customers are doing, wherever they are, and however they are opening the message (e.g., through a mobile device or desktop), these messages and content will always be relevant. As previously mentioned, Selligent assists users in automatically personalizing messages and content based on customer behavior or action. This is made possible by another capability of the platform which is real-time behavior tracking. So how does behavior tracking work in Selligent? When somebody clicks on a link in a web page or email, that specific action is captured and added instantly to the person’s profile in Selligent. Then, the platform’s database is automatically updated with regards to the captured data. This, in effect, will also change any existing rules for triggering and personalizing content. Thus, the content will be personalized in a way that takes into account the most recent engagement of the customer with the brand. Selligent’s capability to track customer behavior permits users to segment their audiences and customers. They will be able to use the data collected from website activities and actions by customers, including their purchase histories to analyze customers and organize them into groups or segments. This way, they can maximize their investments by introducing the most relevant offers to their customers, and at the same time, they can discover new valuable customer segments. With Selligent, users can create, test, launch, and optimize omnichannel marketing campaigns from one platform. It is built with an intuitive journey map designer which lets them layout customer journeys across all channels (i.e., email, mobile web, and offline) through a drag-and-drop interface. Also, Selligent comes with validation and proofing tools that help users ensure that their marketing programs are flawless. They can also set prioritization rules and message frequency controls so that they won’t be overwhelming their customers with messages. 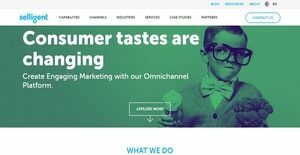 Summing it up, the omnichannel marketing platform provides users with the capability to associate behavioral, situational, customer survey data, and other data types to universal customer profiles. Through such profiles, users will be able to understand how their customers are experiencing their brand. These customer profiles are updated instantly as Selligent fetches data from website, email, survey, and call center; capturing the latest engagements and behaviors of their customers. There are well-liked and widely used systems in each software category. But are they automatically the best fit for your organization’s specific wants? A popular software solution may have thousands of customers, but does it present what you need? For this reason, do not blindly invest in popular systems. Read at least a few Selligent reviews and mull over the factors that you wish to have in the software such as the cost, main tools, available integrations etc. Then, shortlist a few systems that fit your wants. Try out the free trials of these platforms, read online comments, get information from the vendor, and do your research systematically. This profound research is sure to aid you choose the finest software platform for your firm’s unique wants. How Much Does Selligent Cost? Selligent SMB and enterprise pricing information is available only upon request. Contact the company for more details, and ask for a quote. We realize that when you make a decision to buy Marketing Automation Software it’s important not only to see how experts evaluate it in their reviews, but also to find out if the real people and companies that buy it are actually satisfied with the product. That’s why we’ve created our behavior-based Customer Satisfaction Algorithm™ that gathers customer reviews, comments and Selligent reviews across a wide range of social media sites. The data is then presented in an easy to digest form showing how many people had positive and negative experience with Selligent. With that information at hand you should be equipped to make an informed buying decision that you won’t regret. What are Selligent pricing details? What integrations are available for Selligent? Selligent can be integrated with a variety of popular eCommerce, CRM, mobile, and display partners.